This is the first recipe post I've really ever done on the blog (except for one bit on making pumpkin puree circa 2015). I'm always pretty hesitant to post recipes, because to be honest, it's not my thing. I rely heavily on the art of wingin' it and occasionally on the wisdom of better chefs than me to keep myself and my family fed. And let's be honest, wingin' it doesn't always seem blog-worthy. But I think it's good for you to know that I don't always have an elaborate plan or recipe for my meals. And actually, being able to whip up something satisfying from random pantry items and whatever is left over in the fridge has been a God-send, especially over these last few months. I wasn't always very good at this--for a long time I relied on recipes for everything short of cereal and milk (not kidding). But having a child and moving into an apartment on your in-laws land with no kitchen-- it's kind of a learn or die situation. Luckily for you, I'm sharing some of the major lessons I've learned through this experience, so you don't have to do it yourself (or maybe you do, in which case let's get coffee and hug). Lesson 1: You do not have to have complete control of your eating to take good care of yourself. So suffice it to say we definitely eat less veggies than I am used to -- but guess what, my health hasn't suffered, I still find ways to get the foods my body needs through making an extra side OR with one of the MANY other opportunities I have to eat (besides dinner). Moral of the story--it's OKAY to not control all the food you eat, your body will find a way to get what it needs if you listen to it!! Lesson 2: Variety is good in Nutrition and sometimes we need to get out of our comfort zone to experience it. Variety is one of the major nutrition recommendations I make as a dietitian. In today's day in age when most of our foods are made from the same 8 or so ingredients, it's a good idea to try incorporating some variety. And sure, it's not ideal to eat pastries, pizza and hamburgers every day, but it's also not good to limit your food choices to sweet potato, chicken and broccoli. We need to mix it up, expand our taste buds, vary the nutrients we're getting. This can be hard when you insist on limiting your food choices to a few "healthy" items or when you cook all the same meals all the time. Not having a kitchen and eating a lot of what other people fix for me, has allowed me to get out of my own nutrition rut and start cooking with more foods. Foods like peas and corn and green beans (very basic veggies) that I haven't cooked with in forever, because who knows why, I just got in a rut. Lesson 3: You can make a meal with what you have on hand if you're open minded enough. PLUS, it might just be awesome! If you know how to put together a balanced meal (carb + protein + fat + fiber), you've spent some time learning very basic cooking techniques (roasting veggies, making rice, cooking meat etc.) and you've eaten enough meals to get an idea of what tastes good (hopefully all of us! ), then most of the time you can scour the house and find something to make. When it turns out surprisingly delicious, you'll feel like a superstar, further building your trust in yourself and in food. When it doesn't turn out -- it's okay. You likely get to have another eating experience within a few hours. Lesson 4: Every meal doesn't have to be elaborate and top-chef worthy. Speaking of eating experiences, we have a lot of them before we die, like thousands and thousands. And every meal does not need to be top-chef quality. I think when we're in a diet mindset or when we are under-fueled, we become fixated on our next meal. Our brain does this in order to protect us and make sure we meet our nutrient needs. The result is that when we're on a diet or purposefully restricting food it feels as if every single eating experience needs to be amazing and full of pleasure, because to the dieting brain, there might not be another eating experience soon enough. On the flip side, when we are well fed and at peace with food, every meal doesn't have to be v. delicious. It just needs to fuel us and help us feel good. If we want something delicious, our brain knows that they'll be a next meal, very soon. I'm so so thankful for this mindset when it comes to being without a kitchen, because there's just no way that every meal and snack are going to be top notch--yet I can still be satisfied. If this point rings a big bell in your mind, I'd encourage you to check out my grace fueled eating e-course, coming soon! The course is designed to teach you how to fuel, and help you make mindset shifts that will increase the freedom you feel for nourishing your body. Start with 3 Ripened bananas. Peel and mash them up in a mixing bowl. They will look something like this. A good ol, pile of mush -- the riper the bananas, the easier it will be to mash them up good. Next Your'e going to add 3 Tbsp. melted butter, 1 egg (at room temp preferably), 1/4 cup honey and 1 tsp of vanilla to the bowl and mix it all up! Next add 2 c of oat flour or all-purpose (I blended up 2.5 c of rolled oats in my single serve ninja smoothie maker--you could also use a food processor--it made 2 c oat flour). I used oats because--variety. You do you. Next combine 1 tsp cinnamon, 2 tsp baking powder and 1/2 tsp salt in a small bowl (notice it's in an old glass oui yogurt container because of my kitchen-less problems *lol*). Finally, let's NOT forget the most important ingredient, peanut butter. Mix in 1/3 cup of the chunky variety to give these muffins a little crunch. And now the batter is complete. 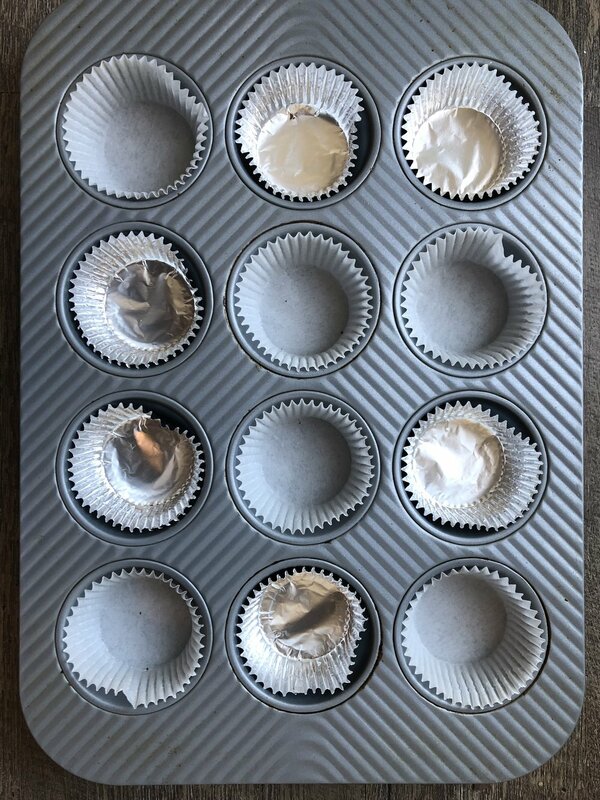 Line a muffin tin with cups (you could just grease it) -- then pour batter into holes until 3/4 full (make sure to appreciate how messy I am when I cook here). Bake in oven at 350 F for 20 minutes. I ran over to my MIL's house for this part (not a mandatory step for you haha). TA - DA!! When they're done cooking let them cool for about 5 minutes (if you can wait that long) and serve it up with a glass of milk - yumm. Side note: little man ate these and approved, so success. The recipe is below if you want to make these without scrolling through my ramblings. But also, seriously, if you've had a similar living situation and you've got a tale to tell / encouragement to share, please do!